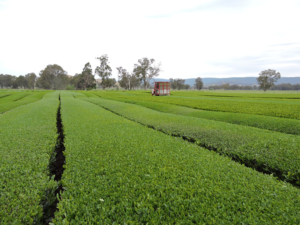 Harvest is the busiest time of year for any tea plantation and it’s no different for Two Rivers Green Tea. Here’s a behind-the-scenes look at what goes on before the tea hits your cup. 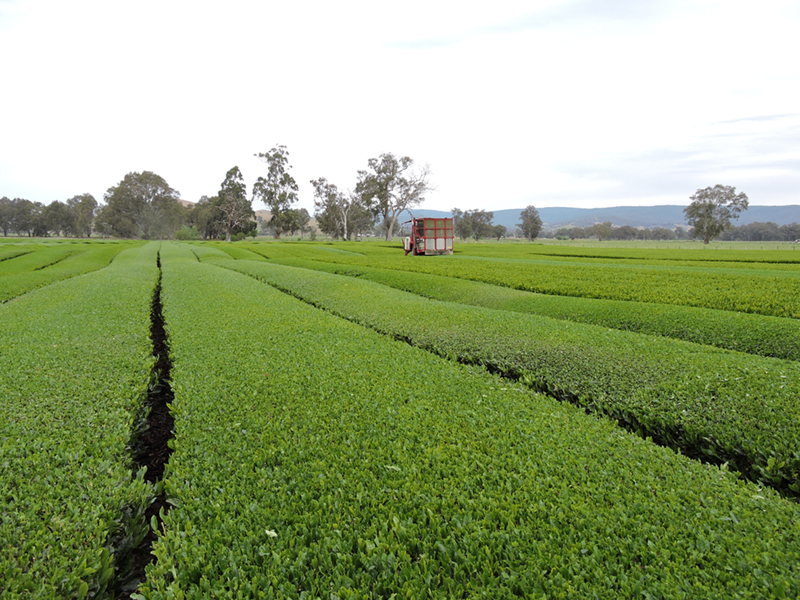 Two Rivers produces Japanese style green tea from our plantation in the Acheron Valley, a couple of hours’ drive northeast of Melbourne. 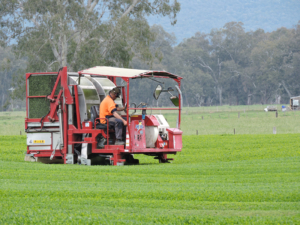 The Australian picking season is, of course, on an opposite schedule to the tea-growing regions in the northern hemisphere and weather such as frost, rain and the amount of sun we’ve had will determine exactly when we pick. We harvest three times a year, usually November, January and March. Here’s what the plantation at Two Rivers looks like when the tea is just about ready for harvest. The tea bushes are planted about 30cm apart to allow the harvester to run its treads either side of the bushes. The body of the harvester is set at about the height where the tealeaves grow up from their stems. There’s a blade that trims at this level, cutting the leaves from the bushes. At the same time, a fan transports the loose leaves into a container at the back of the harvester. When the container is full, the harvester empties the tealeaves into a larger receptacle, which is loaded onto a truck. 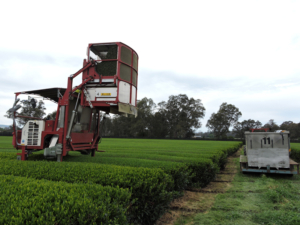 The harvesting equipment is the result of Japanese ingenuity and makes tea picking more efficient so we can get the newly picked leaves to the next stage quicker, resulting in fresher tea. Each receptacle on the truck has a fan in it, blowing onto the leaves to keep them from stewing. 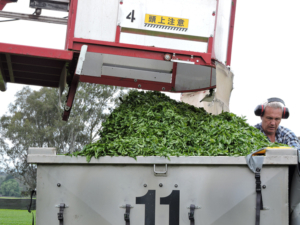 When the truck is fully loaded, it heads straight to the processing plant where the leaves undergo the steaming, drying and rolling that gives Australian-grown tealeaves that clean Japanese taste. 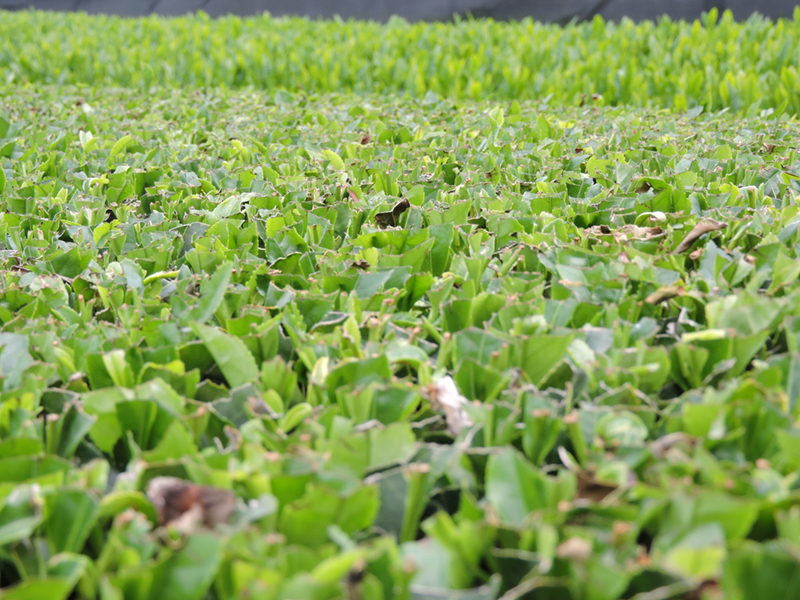 And here’s what the tea bushes look like after trimming—ready to grow again for the next harvest in a few weeks’ time. It takes about a day to harvest about two hectares of tea bushes, so that’s six days to harvest at Two Rivers, which is 12 hectares. 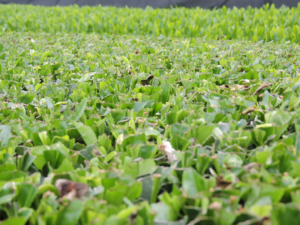 The first harvest, which is what makes our shincha, occurs in late October to early November. The exact date depends on the weather and the readiness of the tea, as different cultivars grow at different rates. 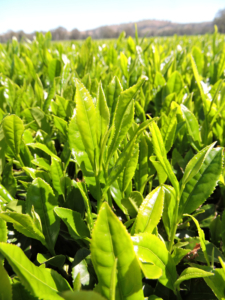 Then, 50 days after the first harvest comes the second harvest, giving enough time for the tea bushes to send out new shoots and regrow its leaves in the warmer weather. The third and final harvest occurs 50 days after the second harvest, in the middle of summer, producing the tea with the most robust flavour. These harvests give us our sencha tea. Waiting a little longer will often yield more tea, but harvesting more tea isn’t always the best course of action. 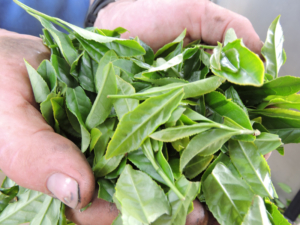 Firstly, it takes longer to harvest tea that’s a little older because the leaves are bigger and the stems are thicker. Secondly, the smaller the leaves, the finer the taste tends to be, so every harvest is always a decision between producing enough tea with the right taste. If you’ve been drinking our tea, you’ll know it’s of a consistent quality, thanks to the tea masters who make these crucial decisions. Green tea tastes best fresh, but a lot of the products you see sitting on supermarket shelves have already taken a couple of years to get there. When you drink Two Rivers Green tea, you’re getting a clean local product that’s at its freshest. Enjoy a new season cuppa—try our shincha today.